I’m excited to announce that I am a now an Ignite Naturals Ambassador and Athlete. Why Team Ignite? It comes down to my desire to fuel for optimal performance, and to do it with healthy, natural ingredients! One principal that I have adopted in my training philosophy is that to achieve premium performance the body requires premium fuel! Now, there has been a lot of studies done about fueling and nutrition for marathon training, and while I am not a scientist, nutritionist, or dietitian, I think most will agree that what a person / athlete puts in their body has an affect on their training, performance, etc. My personal experience using the Nutribullet showed me what I was capable of when properly fueled. More quality training miles led to fitness gains, those fitness gains led to better performance. My experience training with Team Nutribullet helped me to achieve one of my major goals as a runner, one that was always elusive and seemingly unattainable for me, qualifying for The Boston Marathon! There is something about reaching a difficult goal that helps to build confidence. 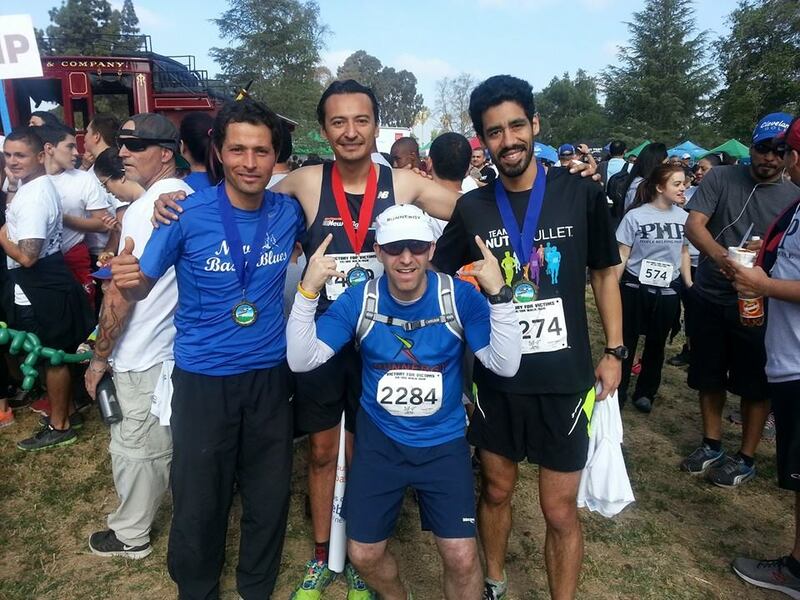 After the LA Marathon I decided to try for a new 5k PR, and in the process try for another goal that has been elusive to me, running a sub 18. Though I finished shy of my ‘A’ Goal (18:07), I came close enough that I shattered any notion that I cannot achieve a goal that I have in my mind. I believe I can, and will go further! While I have come closer than ever to performing to my full potential, I don’t think I’m anywhere close to hitting my limits. In fact, one saying that I share with others, and truly believe is that the only limits we have, are the ones we put upon ourselves! As a member of Team Ignite Naturals, I’m joining a group of founding endurance athletes, nutrition specialists and doctors who are obsessed with revolutionizing sports nutrition using real food ingredients. Ignite Naturals products include everything from hydration products, pre-workout nutrition, energy gels, recovery products and so much more. I can chalk up my recent successes to my training and key workouts. In a given training week I run hills, track repeats and speed work, tempo runs, progressive paced and long slow distance runs. Quality workouts takes energy, it also takes its toll on the body and this is where nutrition, hydration, fueling and recovery products come in. For sure my daily Nutribullet blasts have played a huge part, but experiencing the benefits of proper nutrition has led me to make other changes in my diet as well, being more conscious about the things I put into my body and strategic about fueling. I don’t want to neglect anything that will allow me to train my hardest, perform my best, and be ready to do it again the next day. I also don’t want to put just anything in my body. Honestly, I have been reluctant in the past to use supplements. It seems that just as often as there’s a new magic supplement, there is a new harmful ingredient discovered. I much rather use a product with Natural Ingredients! From here on out, I will continue to push my limits, strive to set new PR’s and break down more barriers to redefine what’s possible for me! So how does one follow up a Marathon PR and Boston Qualifier? How about by running a 5k!? Doesn’t sound very logical, but that’s exactly what I did and it worked out pretty well for me! Following the LA Marathon, I recovered quicker than I have after any of the previous 6 marathons I’ve run. Chalk it up to improved fitness, chalk it up to improved nutrition, you can even chalk it up to running a smart race. Whatever it is I felt pretty darn good a week out from the race. I decided to take advantage of that and move forward with doing more running and focusing on speed. I noticed some unexpected fitness gains. It was weird to me to feel so strong at shorter distances so soon after the Marathon, though the feedback I received from other experienced runners is, this is not abnormal at all! In fact, it happens often. I decided to take advantage of this and shoot for a new 5k PR! What race would I run? I decided to return to the “scene of the crime” of the only official 5k I’ve done. 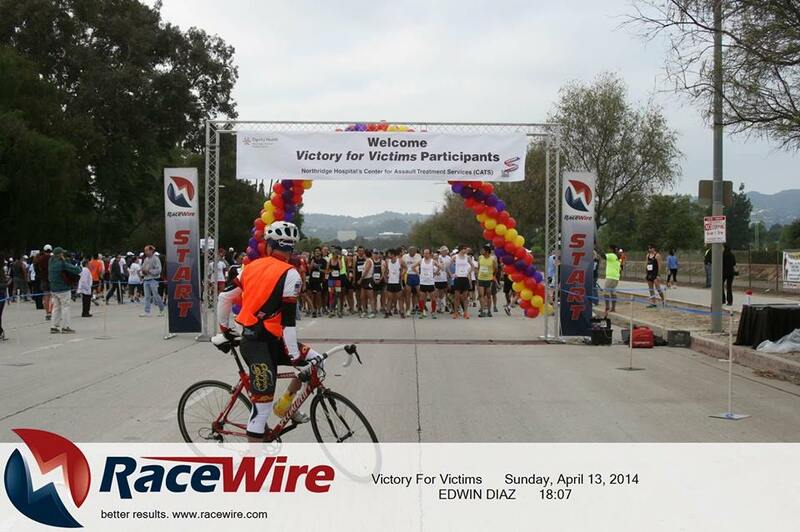 The Victory For Victims race which I ran in 2009 (and won my age group). At that race I set my official PR of 19:37, though that wasn’t my primary target! Going into this race I had an A goal, B goal and C goal. My A goal was a sub 18 min 5k. My B goal was sub 18:30 (to beat my boot camp 3 mile time), My C goal was simply to PR in the distance (beat 19:37). The sub 18:00 time had some significance. First, has to due with my Marine Corps background. Runners under a certain age who complete the 3 mile run portion of their physical fitness test (PFT) in under 18 minutes are awarded the max allotted points. Even though, at the age of 34 I would not be held to that same standard, and a 5k is technically .1 miles longer than the 3 mile distance. 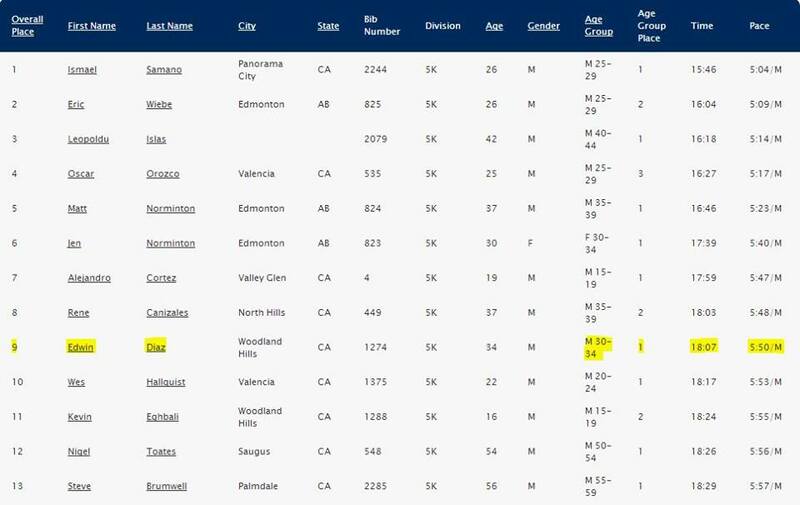 The other significance was something I read on the website of The Los Angeles New Years Race. 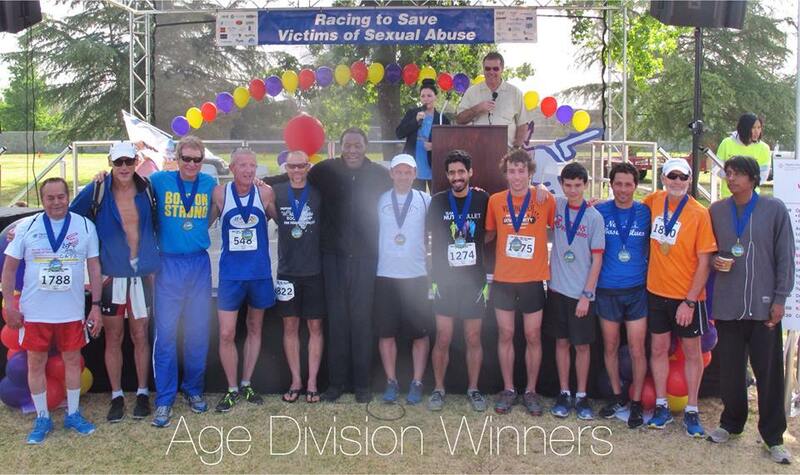 Male runners who run sub 18 minutes are eligible for “Sub Elite” status. Though I don’t consider myself “Sub Elite” it would be pretty cool to get that treatment at least for a day! Anyway, I made it to Lake Balboa / Woodley Park bright and early at 6:30 am to pick up my my bib and t-shirt, and to meet up with some familiar faces (and some new ones). 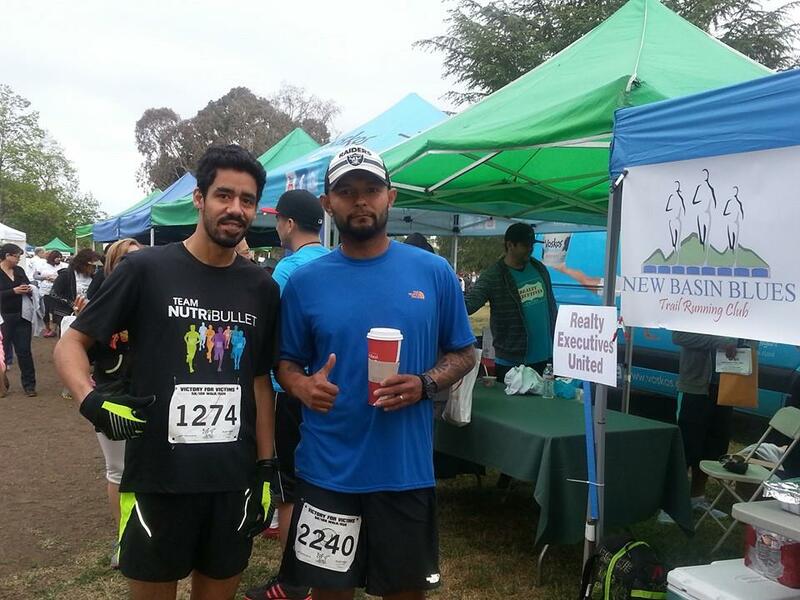 I met up with Jeff from Runnergy Sherman Oaks who was meeting up with The New Basin Blues Running Club. I had run with this group a lot in the past, especially on trails! I caught up with some “long lost” friends and made friends with those I didn’t know so well. Its definitely a nice way to start a race day morning with some great company! For a local 5k it was a well organized event and we had plenty to do at the start. It was an expo set up with vendors, food (Panera Bread supplied pre run Bagel Bites) and swag giveaways (I got a Brooks Mustache Keychain). The Laker Girls were on hand to motivate the runners before the start, though I don’t remember them leading a full warmup as they did in previous years, but I may have been pre-occupied. Olympian Raefer Johnson was on hand as an annual staple to this event. He spoke before the race kicked off and stuck around for the award ceremony post race. At the start of the race everyone was jockeying for position, I told a much older woman to be careful standing right at the start line as some faster runners may try to push her out of the way. When the horn went off I fought a little to get my space and I was off like a bat out of hell. With all of the adrenaline (and a little bit of caffeine) I was flying! When I looked at my watch I realized it was not a pace I could maintain for the entire 5k and came to my senses a bit to avoid blowing up completely. I gradually settled down and followed up the 5:35 first mile with a 5:53 second mile. All the while I was competing with a runner named Rene Canizales. Rene is a New Basin Blues Team Member whom I met before the race. Very nice guy, but who says nice guys ain’t competitive?! We took turns passing each-other at different parts of the race but neither of us was ever too far behind from the other. The final mile plus was tough! I felt like I was just hanging on at this point, but I was still giving my all! This is where my one gripe with the race comes in. The course, at some critical parts was not very clearly marked, and in the final mile it really made a difference! I nearly missed a vital turn but quickly recovered. Thankfully there were some volunteers to show the way… at the last second! I also had to dodge some on-coming runners from the back of the pack. They were coming while I was going. The final obstacle was a pedestrian tunnel which dipped down and then back up ending back at the park for a final right turn on the grass to the finish line. Though I was slightly ahead when we got out of the tunnel, Rene out kicked me from there, and I had no answer! My final time was 18:07 with Rene ahead of me at 18:03. After the race we congratulated each other, I then found out Rene was not even in my age group! He’s 37 and I’m 34, nonetheless, it was motivation that pushed us both and we were both appreciative of each other for that purpose! I finished 9th overall and 1st in my Age Group. 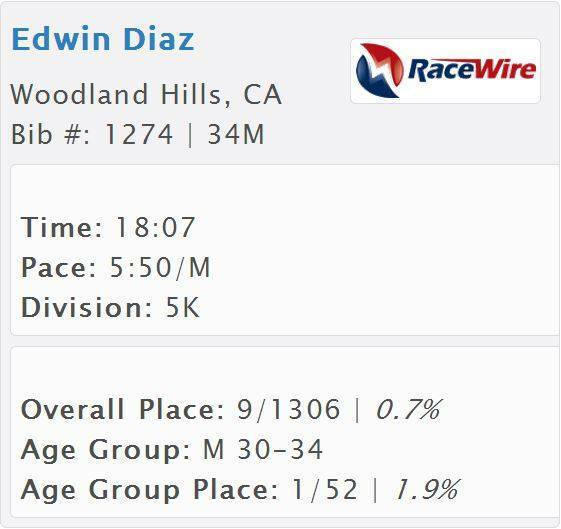 Rene was 8th overall and 2nd in his age group. It felt great to know that I gave it all I had out there! No doubt the friendly competition helped! I am thrilled with my new PR and still have a sub 18 minute 5k goal within reach! Post race festivities were great with hot food from El Torro and Ice Cream cones from Ben and Jerry’s. There were free massages available for runners as well! The awards ceremony was great as every age group winner were called up by name to receive a medal presented by Raefer Johnson. For this race there are no finishers medals for all participants, so if you want to leave with “bling”, you have to place in your age group! Finally a nice bonus is the race pics which were made available online for free! No, not the type with the big bold PROOF stamped on it, but a high quality race pic that can even be personalized with your name and finishing time! Post Race Thoughts: I guess with the 5k, there isn’t as much to pick apart with such a short race. I definitely think I could tweak my strategy a bit and run more even splits, but that’s pretty much all I would change. 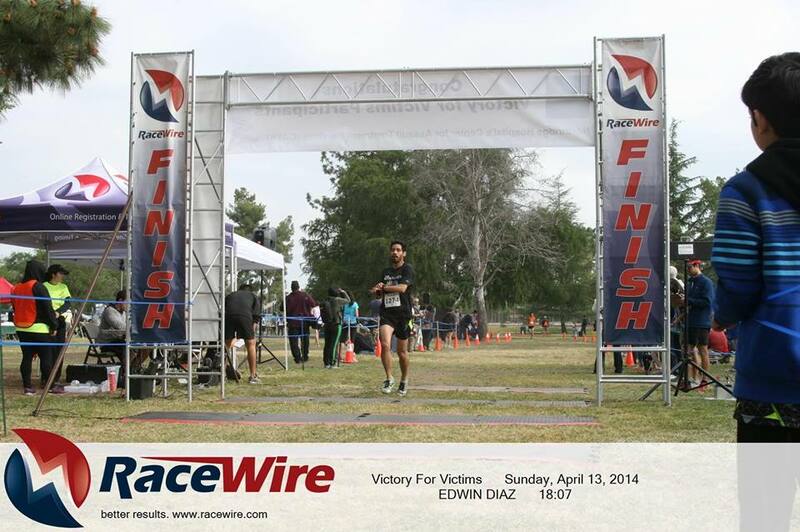 I wore my New Balance Minimus 20v2 for this race and they performed wonderfully. I didn’t feel them, or at any point did I think abut them which is great! This also shows that I was running with good form, since in these shoes you you feel it when your form is not right! I’m not sure what’s next for me. I’m eyeing a Fall Marathon but will likely run a 10k, Half Marathon, or both before then! I hope to keep the PR streak going! 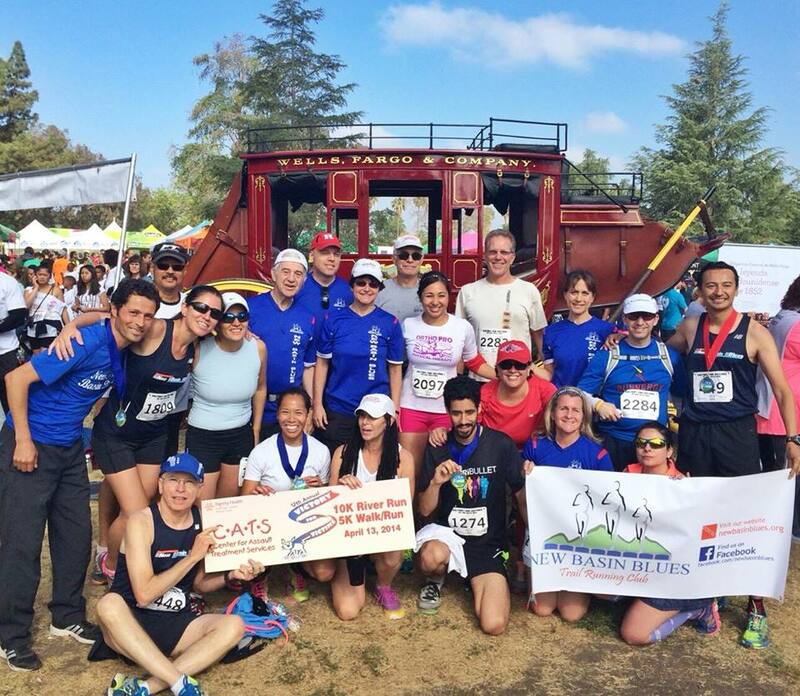 An epic race weekend deserves an equally epic race report! 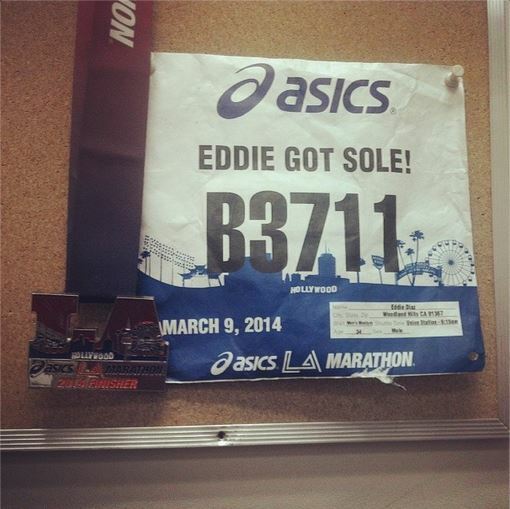 The 2014 LA Marathon will forever rank high among my favorite races I have run. Just an incredible experience from start to finish from the expo to the finish line! Being a part of an Official fully organized and supported training program for the first time has been amazing. It also created such a huge build up for this race, so much so that I nearly blew my training! On the final taper week, I thought it a good idea to run an 8 mile fartlek workout (7 with my friend Marko) I reasoned that we’d take it easy, but no chance of that happening! Competition being what it is, we hit some blazing fast speeds that day. Thankfully that was on Monday and I still had some time to recover before Sunday. But first, the Expo! 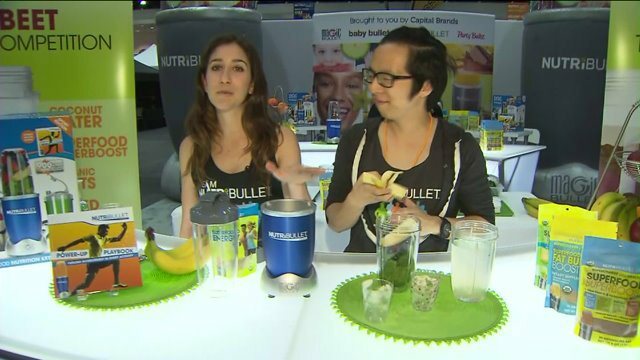 Nutribullet is both a premium LA Marathon partner and sponsors of the Health and Fitness expo. Since I am a member of Team NutriBullet I was invited to take part of some festivities! Since those festivities started at noon, I decided to volunteer at the Ventura Marathon booth to help race director Josh Spiker. I ran the inaugural race in 2013 and had a great time so I would have no problem promoting it! I really enjoyed working at the expo booth and having some great conversations with people about running! 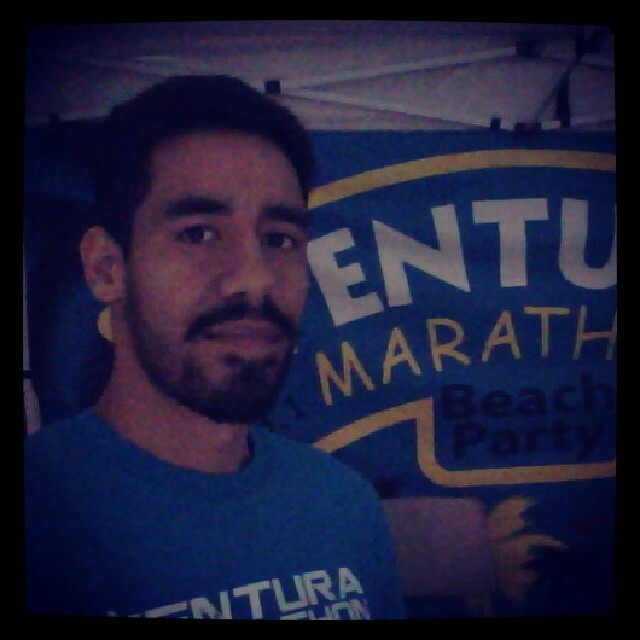 Not to mention I got a Ventura Marathon t-shirt and hoodie out of the deal! Thanks Josh! 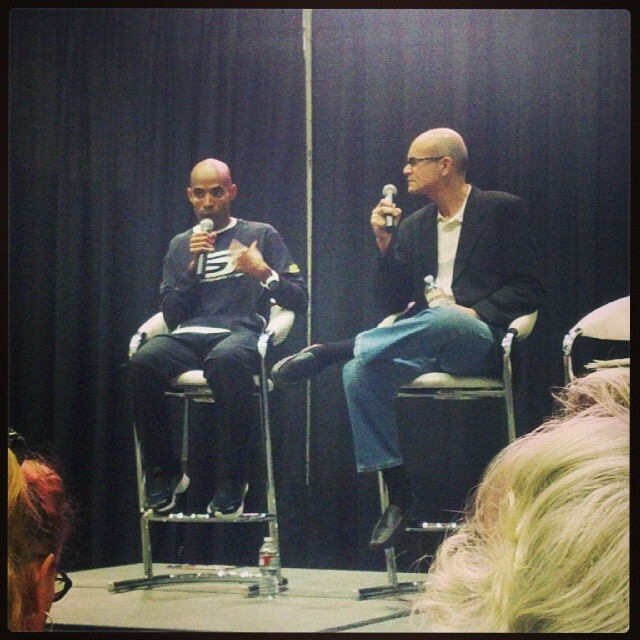 While I was working the booth and helping get runners signed up Meb Keflezghi was taking the stage as a featured speaker! I just had to take the opportunity to listen to my favorite elite Marathoner share the secrets to his success! After that boost of motivation I finished up my work with Josh and prepared for the NutriBullet Festivities! Nadia Ruiz Gonzalez was a featured speaker to share her success of running over 100 marathons! During the presentation we had some Nutribullet giveaways and motivated the crowd as they answered Marathon questions for prizes! After all of the fun we took some group photos and I eventually made my way out. So I thought I was done at the expo when I see the Asics Treadmill Challenge going on. I figured I’d watch for a little bit. “Oh”, I thought. “That guy is pretty fast. Actually he kind of looks like Ryan Hall!” Well that’s because it was Ryan Hall! Ryan, the fastest American Marathoner was holding a conversation on the treadmill at about 4:40 pace. Answering questions and asking some back to the crowd! I answered a few questions myself but took off before it got too late. He had been on the treadmill for 15 minutes by the time I left and I later heard he stayed on for an hour! At 4:40 pace! I got home, found something to eat and started preparing for race day. As this is my 7th Full Marathon my routine is pretty set. I laid my clothes out, prepared my morning meals and tried to go to bed at a reasonable time. There was a lot threatening to go against me on race day, the weather, the early morning, the time change. I didn’t let any of this get to me though, somehow I was just confident that everything would work out! Race day morning (If I could even call it that) was crazy. Crazy as in, why would you do that if you are about to run a race? I woke up at 1:30 am, gave me 30 minutes to get ready before my friend Mike picked me up at 3 am. Yes, you heard that right! No my math it not off. This was due to daylight savings time, and the clocks going forward. Yay, exciting stuff! For breakfast I had some oatmeal with chopped apple, and 2 whole grain pancakes which I carried with me in a container. I also brought a pre-made Nutriblast! I spaced out my eating, starting with the oatmeal. Since our shuttle was at 4 am I ate the pancakes and left the container in Mikes car. I brought the Nutriblast along on the bus to drink when we got to Dodger Stadium! We arrived early and I took advantage of no lines for the porta Johns. I also picked up a banana and a bottle of water for some extra nutrition before the run. 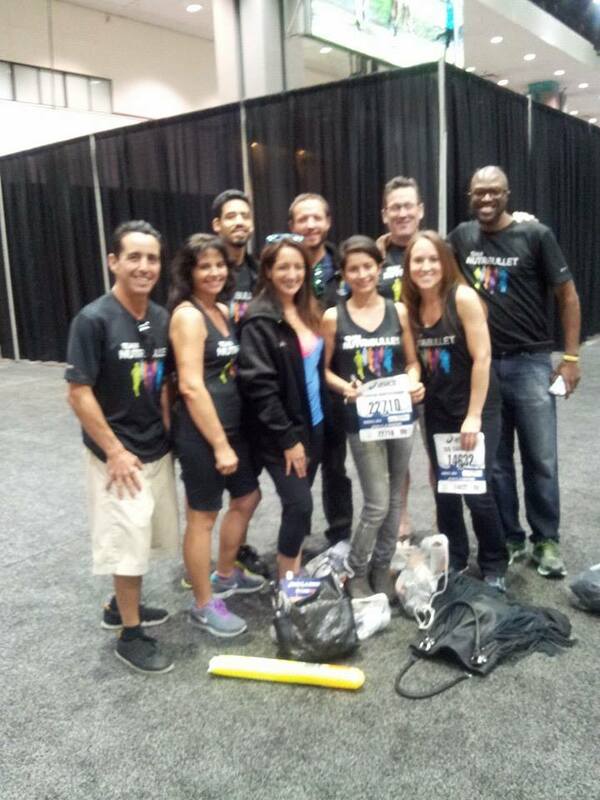 I met up with my fellow Team NutriBullet runners prior to our 5:45 am festivities. The fun was about to start! 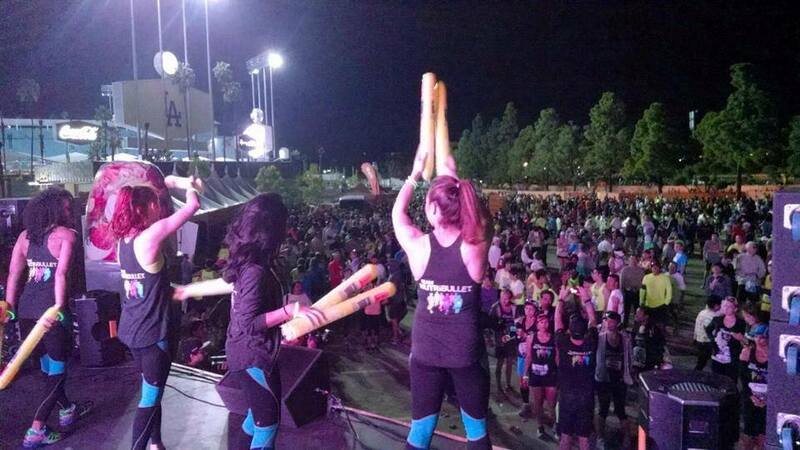 Prior to the Marathon there was a DJ on stage, NutriBullet Dancers hyping up the crowd, glow sticks, thunder sticks and loud party music! Wait, did I sign up for a Rock n’ Roll Marathon? 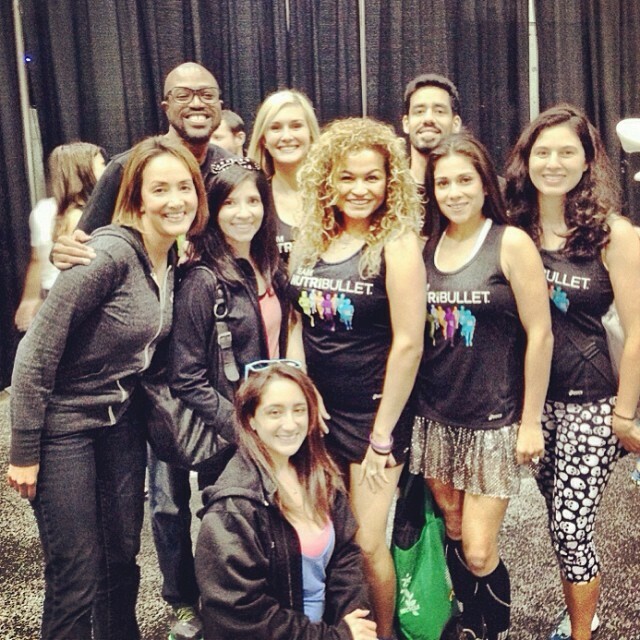 Nope this was the new LA Marathon and NutriBullet was getting the party started right! Team NutriBullet was asked to get out in front of the stage and do the twist while a video played in the big screen of us doing the same after one of our long training runs! A video collage of the Team Nutribullet training season was also played on stage, and I have to say it felt pretty good to be a part of this group for the LA Marathon. All of this was both getting me hyped up for the race, but also calming my nerves about the race at the same time. Usually during a Marathon you have time to sit around and get nervous, with all of the festivities, no such chance! Before heading to the corrals I made one final stop at the porta john to make sure nothing was going to throw off the race! I met up with my friends, Team NutriBullet Coach John, Luis, Marko in the B corral and had my first GU about 20 minutes before the gun went off. Game time! My strategy for the LA Marathon was to start the race at an easy pace and run negative splits. Original plan was first 3 at 7:30 pace, next 3 at 7:15 the bulk of the miles at 7 minute pace and then try to pick it up after the VA. After receiving some solid advice from Crispin Lazarit I decided to study the course map a bit more and plan to run certain miles based more on effort with my pacing plan as more of a guide. Since I was planning to run the early miles easy I figured I’d have some fun with it! I ran with John whose plan was to run with all of the Team NutriBullet runners at some point of the race. I purposefully went easy in the first mile since I knew we were hitting a downhill that could cause us to go out too fast. Dodger Stadium was rockin’ and I was the voice of reason keeping our small group in check. First mile slower than planned! Mission accomplished! There’s so much to love about the early miles! When I ran this in 2010 I didn’t run through Chinatown or Little Tokyo so the course change since then was great! Then there’s familiar favorites like Disney Concert Hall and those amazing Drummers! Echo Park also brought fond memories! Through it all I was engaging the crowd and feeding from there energy, so by that logic… Run slow to conserve energy + extra energy from the crowd = energy surplus! After mile 6 is when I started my focus on Marathon Pace. John and I ran about another mile together and then parted ways, me to run my race, and him to support his trainees. This is also where I really hit my stride and clocked some of my fastest miles of the race. I just went with it and made sure my effort was on par with my pacing plan. I really enjoyed Silver Lake as the mural on Sunset has always been a favorite of mine during previous training runs. I also came across the groovy 70’s Funk Soul group which prompted some high 5’s! I saw a pretty funny sign on this stretch of the course that read “Smile if you pee’d a little” It was so unexpected that I couldn’t help but laugh! I knew that I’d be entering Hollywood and with that i’d get a huge energy boost! I ran into Michael Blackson around Hollywood and Vine entertaining the crowd and having fun! I ran over and gave him a high 5! I think that glitter glove sprinkled a bit of magic on me because I only got stronger from then on! After the turn on Orange I got back on Sunset Blvd and all I could think about was Nutribullooza! I was very hyped up thinking about it! I remembered from last time that West Hollywood had a lot of energy from the crowds so I was feeding off of that as well! 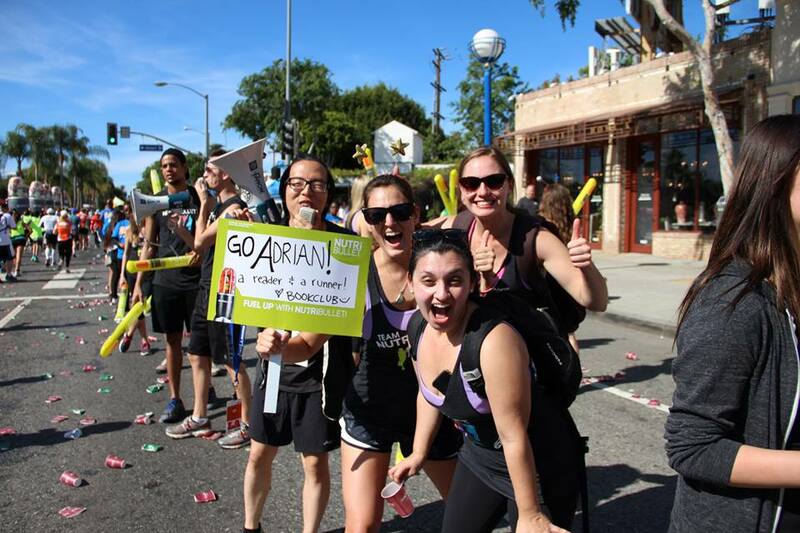 When I made it to Mile 15 I took my gel and had my eyes peeled for those NutriBullet Shirts! I heard the crowd calling my name and looked back to see Nutribullet T-Shirts! I looked ahead to see our Fitness Trainer Monique cheering me on! I also saw Jeremy our camera/production guy and gave him a huge high 5 as well (are you seeing a theme yet?)! The great thing about the LA Marathon is that there is never a dull moment! Beverly Hills was a welcome sight as its always fun to run on Rodeo drive! Going into Century caught me completely off guard! I had heard about “Cheer Alley” but didn’t expect what I ran into! Cheerleaders from all sides, I felt like an NFL player running out to the field before the start of the Superbowl! It was insane and granted me yet another energy boost! At this point of the race I was still going strong and feeling great! I knew that the VA was coming up but I also knew what to expect! I was sticking by my plan to run the VA Hills by effort. My pacing had been great so I knew that 1 or 2 slow miles weren’t going to break me in any way! While entering the VA Grounds I saw Cynthia from LASP cheering on! She spotted me and yelled out some encouragement which is just what I needed before the toughest part of the course. Indeed, this was not easy but at least my legs had some life to them. While running through the VA I kept in mind my cause (raising money for Veterans) and yelled some encouraging words to the crowds! I grind-ed my way through it and got a little emotional when I saw San Vincente! I was 4+ miles away from reaching my goal! The final 4 + miles (My final total was 26.45 miles) was all about focus and determination! I put my game face on and the gloves literally came off! I knew from 2010 that just because I was on San Vincente didn’t mean that it was going to get easier right away, or that I could start relaxing. Nope! My legs were feeling the toll of so many miles by this point, its to be expected! I knew that if I just held things together I was going to be very happy at the finish line! 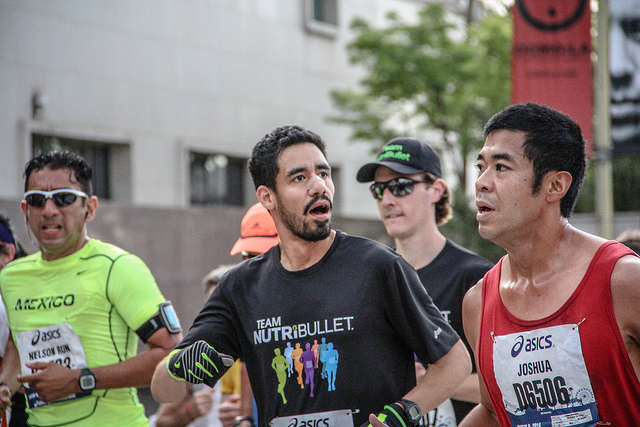 I clocked my fastest mile of the entire race at mile 25 (6:36) and once I hit ocean I was overcome with emotion! I cruised in at 3:06:38 gun time (3:06:24 chip time!) I ran a 6 minute PR and my first ever BQ! Boston 2015 here I come!!! I got my medal and some water but the most welcome sight was an ice cold wet towel handed to me by one of the race volunteers! It was heaven! I walked way to much after the race, since my phone wasn’t working properly. When I finally got a call from my wife I was ready to go and get some food! 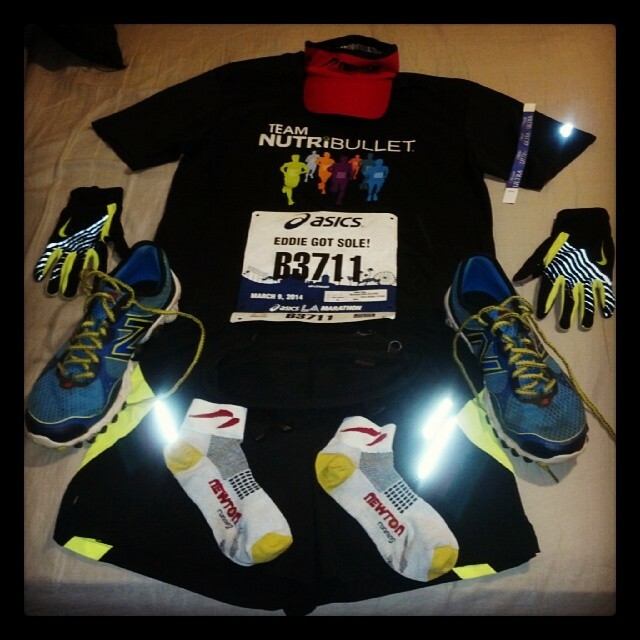 Would have been great to meet up with Team Nutribullet post race, but my body simply wanted some food and rest! Congratulations to all of the 2014 LA Marathon finishers! Though I beat most of the heat, I heard about the hot conditions. I hope everyone was safe during and after the race, you all have my highest respect! 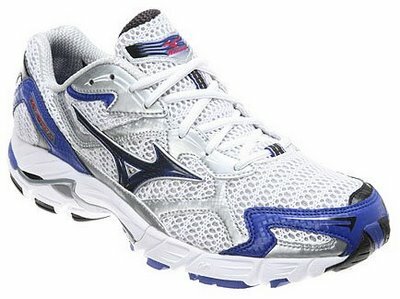 Unless you run barefoot, a pair of running shoes is arguably the single most essential item for a runner. Through the years running shoes change, and often times its difficult to replace a shoe that you loved. Sometimes its quite the opposite, you cant wait to retire a pair of shoes and replace them with something better! Sometimes you simply need shoes for different types of runs. Since I’m tapering for the LA Marathon, I’m trying to stop making myself crazy by obsessing over ever detail of my upcoming race! I decided to review my running shoe history and track the progression I’ve made since I started running. 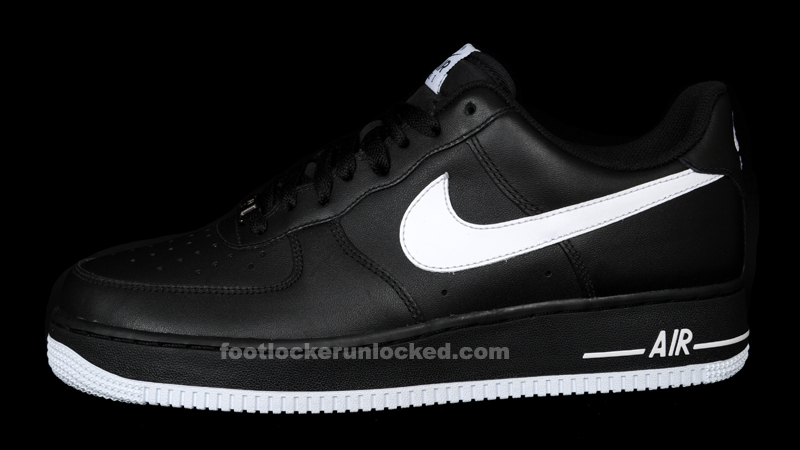 Non Running Shoes – Nike AF 1’s / Fila Grant Hills: When I had to train in High School before joining the military, it was probably one of these shoes that were definitely not made for running. Hey, I didn’t know any better!!! 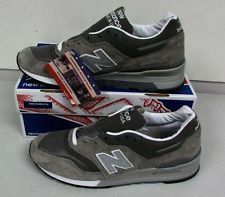 Military Running Shoes – New Balance Boot Camp Trainers: Standard issue “go fasters” not sure of the model. I can’t really tell if they made my feet hurt or not, because, lets face it, everything hurt during Boot Camp! Asics Gel Cumulus VII: I know I purchased lots of different shoes while in the Marine Corps but these are the only ones I can remember aside from the boot camp shoes. I continued to use these for a little while after I got out of the marines. 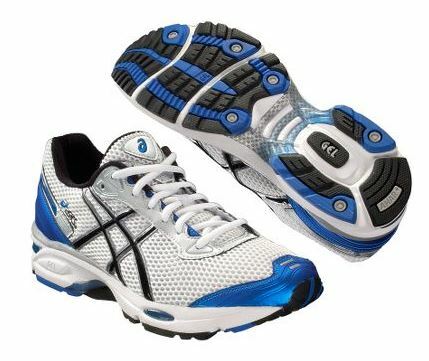 I had no idea about how to pick running shoes when I bought these but had heard a lot about the Asics Gel. 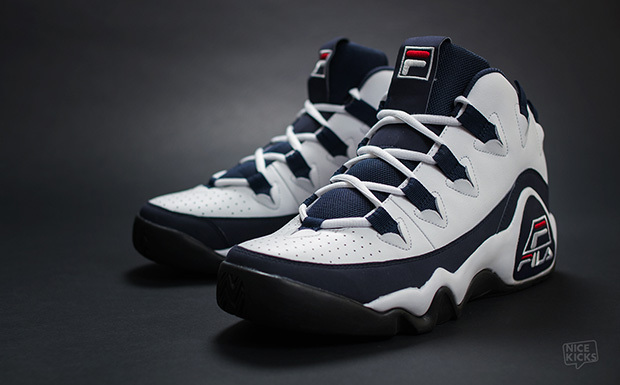 I actually loved this shoes and tried hard to find them again after I got out but never did. Definitely made my feet feel great after many miles of running in them, but the newer model changed so much that it was essentially a totally different shoe! I’m pretty sure these shoes were promoting heel striking so they’re not something I would wear now! 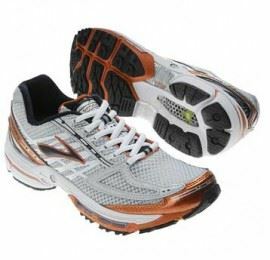 My Brooks Phase – Brooks Infiniti, Brooks Infiniti 2, Brooks Axiom 3: The first time I stepped foot into a specialty running store it was The Starting Line in Venice. I wanted another pair like the Asics Gel Cumulus but since they were so old and outdated I had to be recommended something else. The salesman had me try on at least 6 different pairs of shoes, asking me which one felt the best, while looking at me run down the road in each shoe and telling me that I over-pronate. He recommended the Brooks Infiniti which were the most expensive at over $120. I wasn’t sure, but I took his expert advice and bought them. I ran my first Half Marathon in them (’09 Surf City), and then picked up another pair at the expo which I used to run the ’09 LA Marathon. The thing about the Brooks Infiniti, though they had great cushioning and pronation control, they were very heavy (about 13+ oz). I wore the Brooks Infiniti 2 for my next full before picking up the Brooks Axiom in an attempt to go lighter. Aside from them being lighter, I never really liked the feel or the ride of the Axiom that much. As a result I didn’t run any races in them, but they stayed in my rotation for a little while before I finally retired them for good. 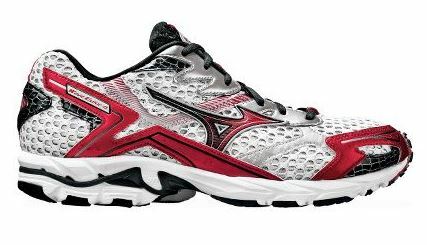 My Mizuno Phase – Wave Elixir 4, Wave Elixir 3, Wave Inspire 4, Wave Ronin 2: I first fell in love with Mizuno Shoes during a fun run at Runnergy in Sherman Oaks. 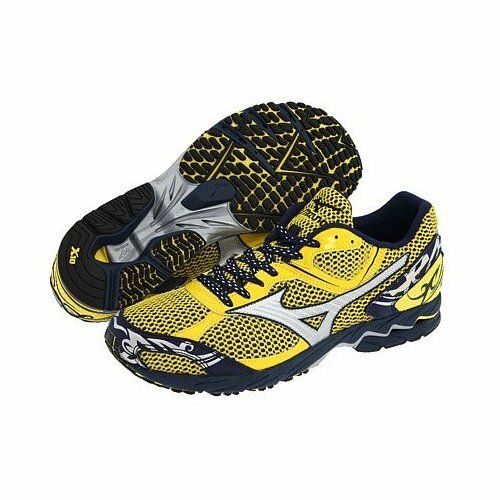 Mizuno was there for shoe testing and I tried a pair of the Elixir 4’s, I picked them up and started using them for my speedwork around the time I was still running in the Infiniti 2’s. I loved them so much that I wanted another pair. I couldn’t find the 4’s but I did find the Elixir 3’s on the discount rack in Roadrunner Sports. After a little while I loved them more then the 4’s (better fit) and I ran the 2010 LA Marathon in them as well. I rotated between the 2 during the 2010 Ragnar Relay. What I loved about the Elixirs were how low to the ground and light they were. I had never run in a shoe quite like that and I was running faster as a result. However, the lightness of the shoes took their toll and I needed another pair with more cushion to rotate them out with. When I picked up the Elixir 3’s I also picked up the Wave Inspire 4’s. These were supposed to by my “every day trainers” but after 2 runs I realized they weren’t going to work. They simply hurt my feet and did not find their way to my permanent shoe rotation. Even though I got them for dirt cheap they were still a waste of money! 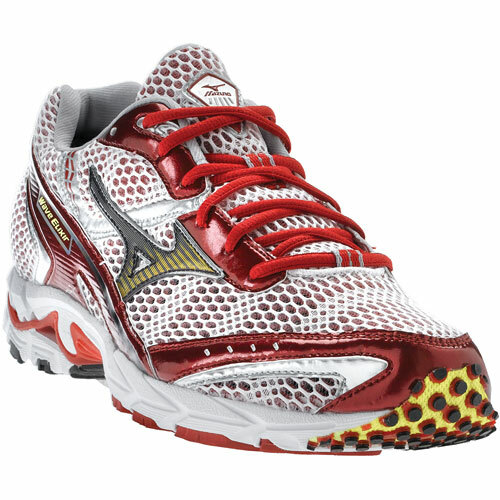 I discovered the Wave Ronin 2 the same way I discovered the Elixirs, during a Mizuno Test Run at Runnergy. These shoes were even lighter and lower the the ground than the Elixir and just looked fast. For such a low profile shoe, I put a lot of training miles on these puppies! 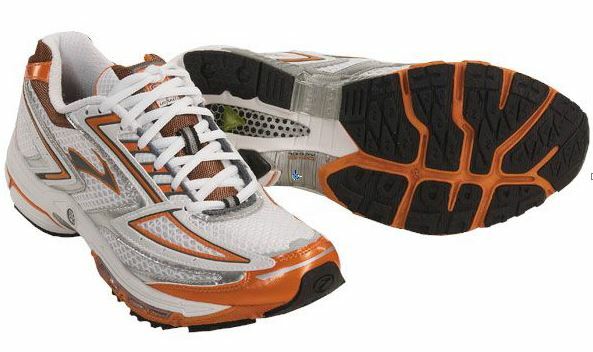 I ran the 2011 Pasadena Marathon in the Ronin’s and thought for sure they were my secret weapon to qualify for Boston. Well, 2 things messed that up: a hilly course and improper training! Nike Pegasus Bowerman 25: I won these shoes in a Nike + contest. I thought I was going to get the new Nike Lunar Glides (remember those?) but I was sent the Pegasus instead. I thought these shoes were big and bulky, but they didn’t annoy me like the Wave Inspire so they found a place in my rotation. 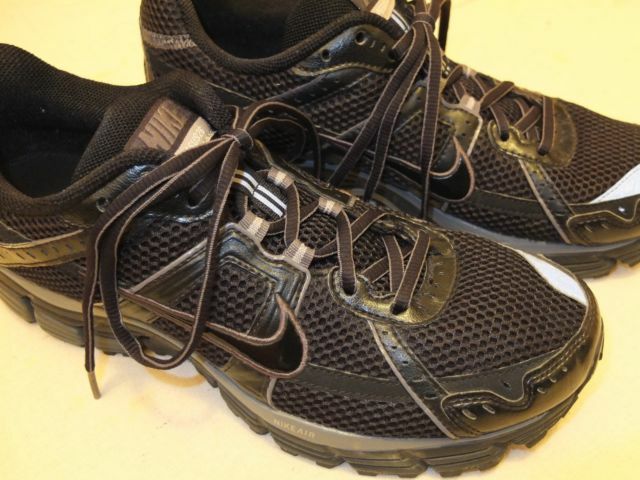 I used these shoes for trail runs, in-climate weather runs, and recovery runs when my feet and legs were sore. 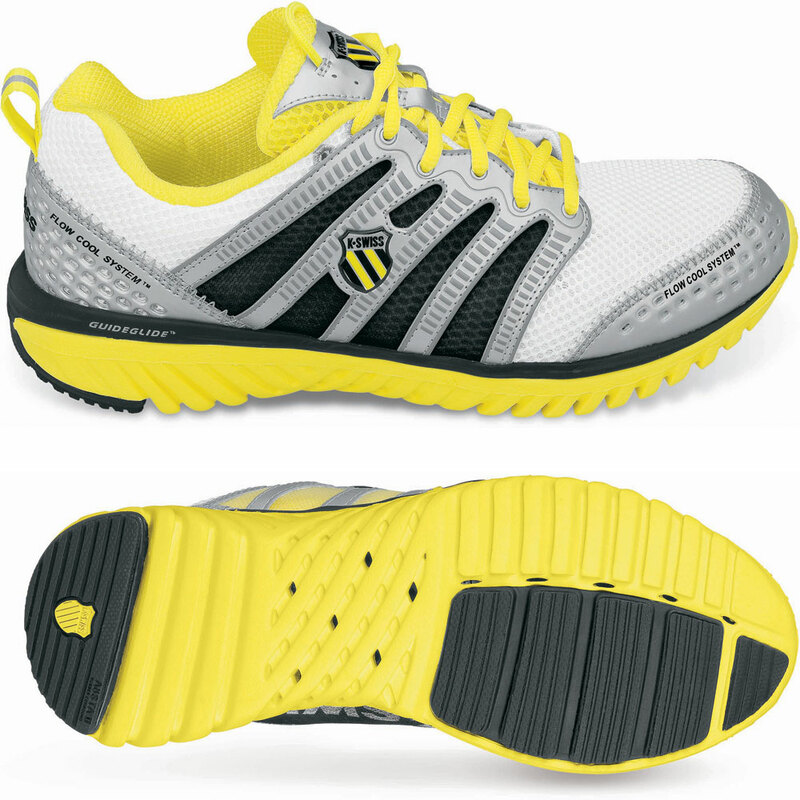 K Swiss Blade Light Run: Another shoe I discovered during a fun run/test run at Runnergy. 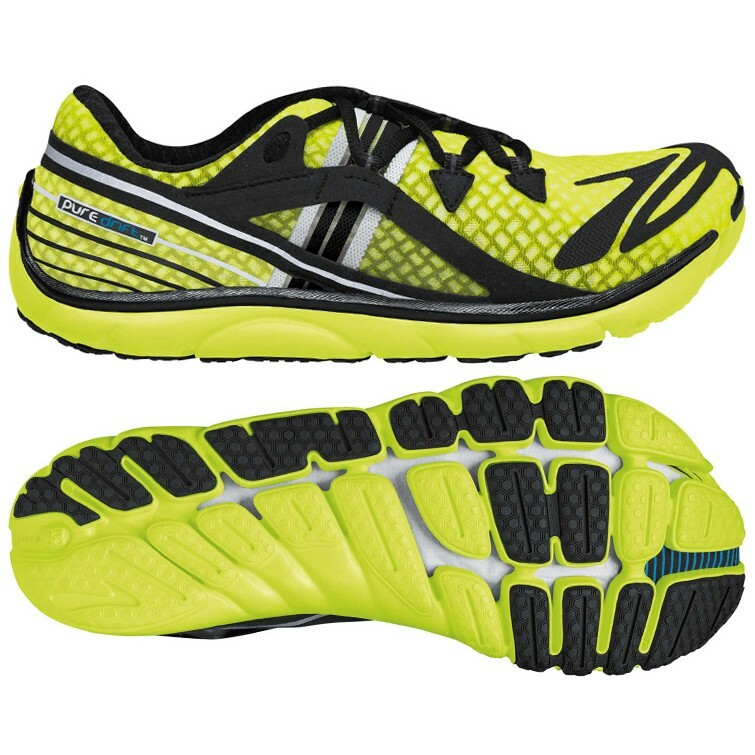 I actually really enjoyed these shoes they were fast yet cushioned and had a smooth ride. The one gripe at the time was the exposed foam, but now that’s something that is becoming more and more common place in an attempt to make shoes lighter. The only reason I didn’t run a race in this shoes is because the Ronin’s were much lighter and I thought I could PR in them, though I ran some 20 milers in the Blades and felt great! These shoes also had an 8 mm heel to toe drop which was the lowest I’ve run in at any point up til then. 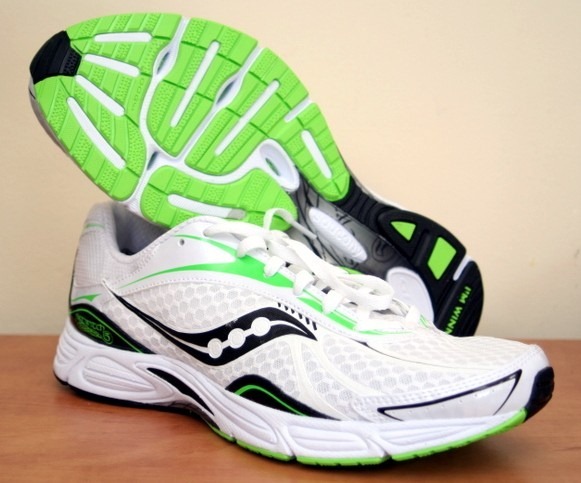 My Saucony Phase – Kinvara 2, Fastwitch 5, Kinvara 3: I started hearing a lot about Saucony shoes, specifically the Kinvaras for a while. The first time I heard about the Original Kinvara’s I thought they were too “minimal” for me. 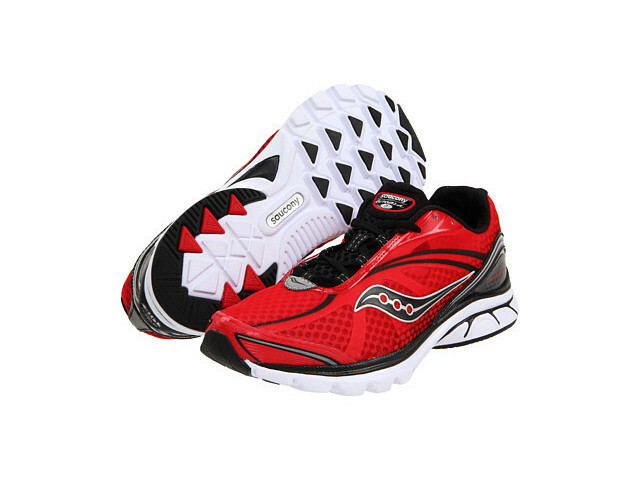 Since I started making the transition to lighter more low profile shoes I finally decided to try the Kinvara 2’s when I found them on sale online. Yes, I purchased these shoes without having tried them on and was pretty certain I was going to love them, and when I got them they didn’t disappoint! When I first started training in the Kinvaras my Ronin’s and Blades were nearing the end of life, but I was rotating them. 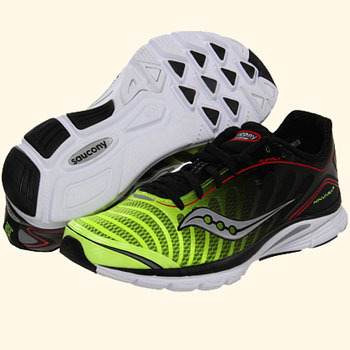 While the Kinvara’s felt great there was a transition to be made to this reduced running shoe. I was making the transition to running on my midfoot/forefoot and my calves were adjusting in a major way. Once I was fully adjusted, it was on. 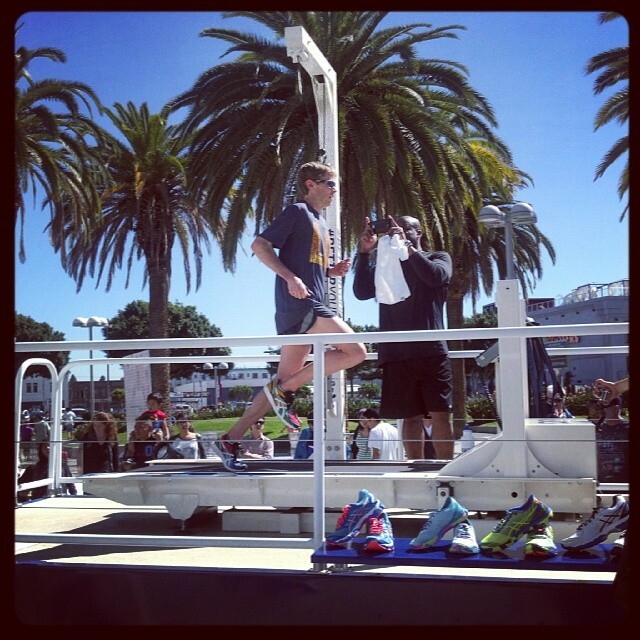 I picked up another pair and wore them for the 2012 Malibu Half Marathon. 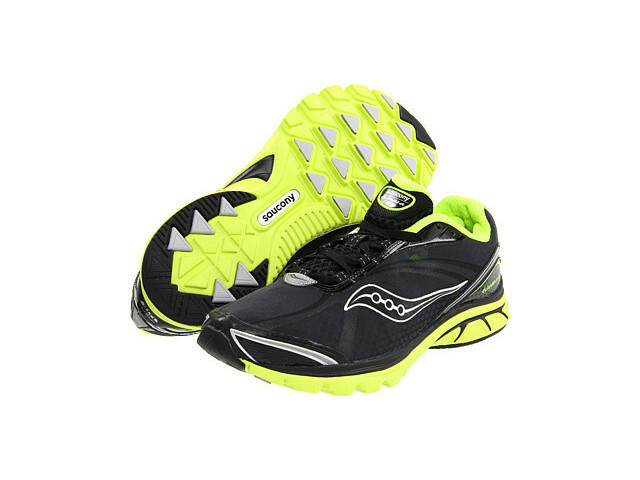 I picked up a pair of the Saucony Fastwitch 5 on a whim during a trip to the Saucony Outlet in Camarillo. I was actually looking for another pair of Kinvaras but they didn’t have my size, so I picked up the Fastwitch instead. 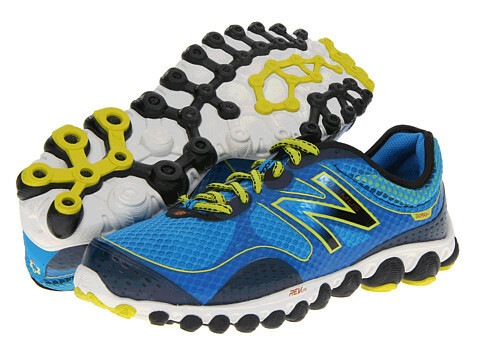 With a 4 mm drop, light weight, and stiffer ride they were great for speed work and tempo runs. I ran the Rose Bowl Half Marathon in them and they held up pretty well through the mixed terrain. Even still, I enjoyed running in the Kinvara much more so when the time came for another pair I picked up the Kinvara 3 instead. 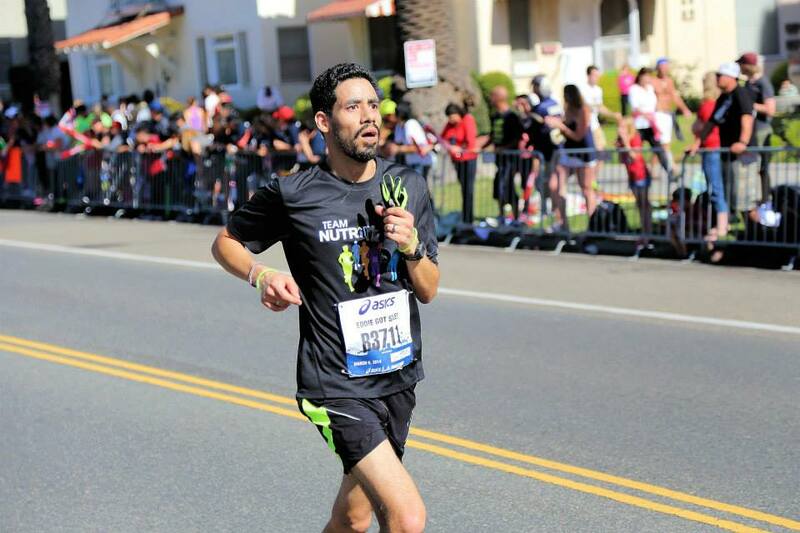 I recently ran the Ventura Marathon in them, finishing with my second fastest time. 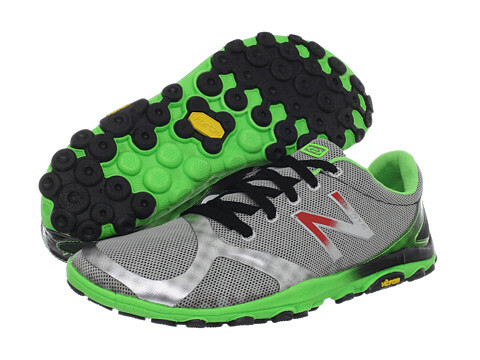 Going Minimus – New Balance Minimus M3090v2, New Balance Minimus MR20v2: I almost wasn’t going to “Go Minimus”, I actually was content in “Staying Kinvara”, but I am glad that I have discovered the New Balance Minimus line of shoes! I have already reviewed both of these shoes in detail on this blog so I won’t go into too much detail. I received the Minimus M3090v2 as a Christmas gift and the Minimus MR20v2 as a birthday gift 2 weeks later. A natural progression from the Kinvaras. Brooks Pure Drift: This is my first pair of Brooks since the Axioms and my first pair in their “Pure Project” line. Early this past week I learned that I won a $100 gift card from Brooks Running. Since I’m not currently wearing any of their shoes I decided to try something from their Pure line which I have been very intrigued about. I chose the Pure Drift because it was the lightest and most “minimal” of the choices. I figure, if it doesn’t work out for longer runs its super light so I can use it for speed. But if it does work out for longer runs then all the better! I’ve read some very mixed reviews about this shoe, and while I have yet to run in them they were extremely comfortable and fit perfectly when I tried them on. 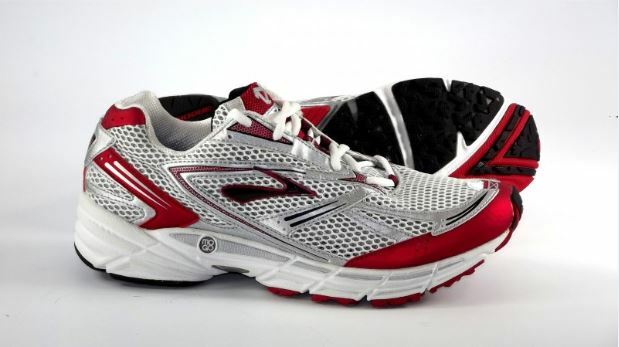 It’s also worth noting that I may be the demographic that Brooks was going for when they designed this shoe. I’m a light weight runner looking to run fast! So now you’ve taken a look at my running shoe history whether you’ve actually read all of this or just looked at the eye candy 😉 Go ahead recommend some shoes for me to try! Merrell, Altra, Newton, Vibram? Something else form the brands I’ve mentioned above, or something else all-together?! I’d love to hear what you think! As I’ve already shared, my next “Adventure” will be training for, and running the LA Marathon with Team NutriBullet. While I will be receiving lots of support from Team NutriBullet, I will be sending my support to Brenai Foundation. Every time I lace up my shoes for a training run, up until I lace them up for the LA Marathon and beyond, I will do so with the goal of Fundraising for Brenai Foundation. Brenai Foundation is a charity with the goal and purpose of helping support Military Veterans. They will accomplish this goal by providing education, aid, and resources to disabled and low income vets, help veterans and their families with transition assistance, aid and support for military families who are separated from their loved ones, and much more! As a Marine Corps Veteran I know first hand the challenges many service men and women experience when they separate from the Military. And so does Brenai Foundation founder and CEO Keaver Brenai, who created the charity after witnessing her own family members in the same struggle. I have shared my experience, 8 1/2 years in the Marine Corps – this is where my running history started so its only fitting that I use my running ability to help support veterans. Aside from my own service, I have many friends, family members – cousins, aunts and uncles, etc. who have also served. “There is no reason a Veteran should become jobless or homeless due to lack of resources and knowledge.”, says Keaver Brenai, founder of Brenai Foundation. She, and the rest of her organization is not just talking about it, they are out there working hard and doing something to create real change! It is that level of dedication that makes it and easy decision for me to choose them as my charity of choice for the LA Marathon!